At this year’s MomoCon, members of the narrative team hosted a panel on the fundamentals of narrative design for Guild Wars 2. With help from the audience, they created the basic concept for Vikki and her moa, Momo, who you can read more about in chapters one, two, and three of their story. 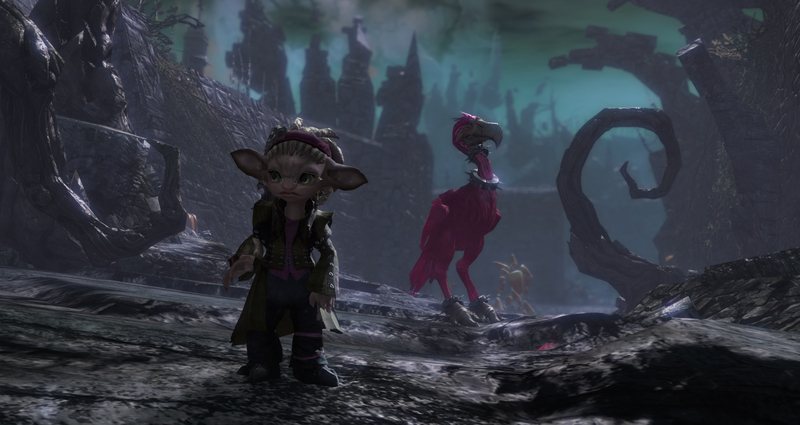 Twilight had fallen by the time we crossed the Krytan border, which nixed my plans to let Momo run around for a while. It also meant that we got all the way to Shaemoor before I realized something was slipping around in the trees behind us. I hunkered down in the open road to feed Momo an apple, taking the opportunity to look around. When I didn’t see anything, I watched Momo instead—sure enough, after she’d demolished her snack she whistled and fluffed up nervously. Whatever was back there had stopped moving when we did. But there were plenty of things to be scared of in the Krytan countryside at any time of year. Like skelk. Or bandits. I hustled Momo along. A scout pointed me toward the moa ranch. It was tiny, but their birds seemed to be in good spirits, and the hands were just putting them all into the pen when Momo and I arrived. Mepi, the ranch’s owner, stopped to talk to me at the gate. I explained why we’d come, and apologized for arriving so late. It was a very generous offer. The Krytan ranchers don’t have much except what they make themselves, and I was a stranger. Still, the idea of spending the night made me feel a little queasy. What would I say if they tried to do something nice for me to be polite? What if I made a mistake and did something to mess up their house? What if they served moa for dinner? I draped the blanket over my shoulders and settled into the stable with Momo. She fussed, preening at my hair, then curled around me. I leaned back against her—she doesn’t make a bad pillow—and propped my feet up on my pack. The little black cat nosed my chin and draped itself across my legs. Momo opened one eye just long enough to be unimpressed with it, and I relaxed again. This wasn’t bad at all. The grass smelled sweet, the moas were warbling contentedly not far from us, and the windows of Mepi’s house glowed with a soft, golden light. I’d slept in much worse places in college. With one hand under the cat’s chin, I closed my eyes. I dreamed I was falling through a starry sky, a green miasma swirling below me. When it broke, I was in open air. 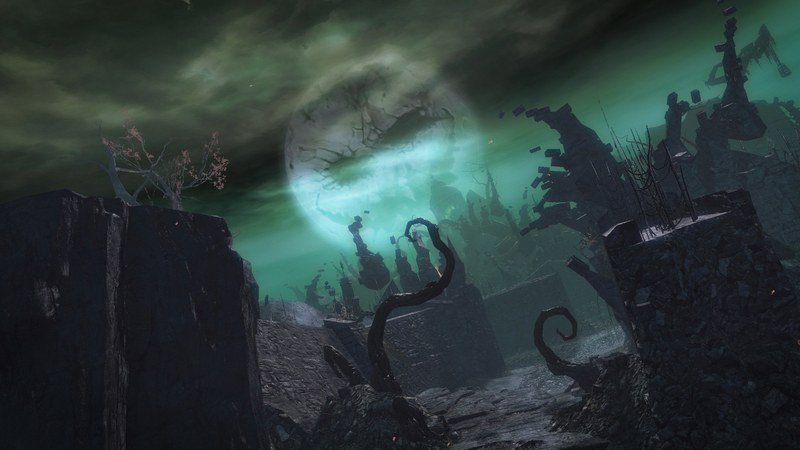 Below me stretched a vast, twisted landscape of black stone, warped and barren trees, and strange fires. A broken path wound through it, opening onto a graveyard with one lonely mausoleum raised on a spire of stone at the center. I heard laughter and screaming, and as I hurtled closer I saw that the labyrinth was full of people, all of them running, fighting, and dancing as they went around and around. No, not just people—creatures. Above the chaos, the moon loomed, grinning. I shut my eyes tight. When I opened them, I was standing on a cliff overlooking the labyrinth. More people jostled around me, passing in and out of a door that opened to the starry void. They were terrifying and a little unreal: a human lady in a corseted velvet gown; a sylvari with horns and huge, leathery bat wings; another asura wearing a fiery pumpkin-head mask. All of them carried weapons. Some of them walked to the edge of the cliff, stood on a sigil, and vanished in a rush of wind. I turned back. A charr stood on a raised stone platform near the edge of the cliff, leaning on a staff. He was dressed in a tattered shroud, blindfolded and draped in chains, his horns sawed short. At least, he looked like a charr—his tail glowed like a live ember. The labyrinth was too big, and the screams and laughter were too much. All of the people passing by were dangerous and powerful. I felt completely lost. I fled to the door, dragging Momo with me. If I could have carried her, I would have. This time, when I tumbled into the starry night, I only felt relief. When I woke up, my heart was still racing. The cat had gone, leaving my legs cold. 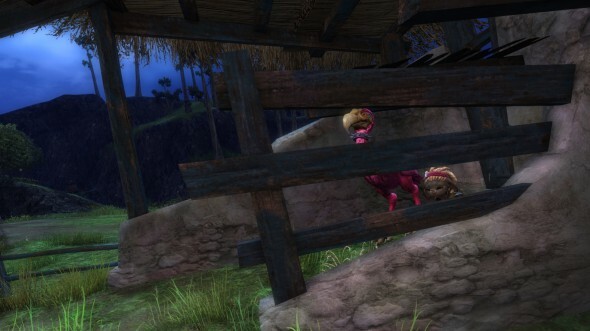 Momo was fast asleep, and so were the other moas; I didn’t even hear a peep. I laid very still and tried to calm down. I concentrated so hard on convincing myself that my imagination was working overtime that I didn’t believe my eyes when a patch of shadow pulled free from the stable’s back wall and crept toward me. Not happening, I thought, pretending to breathe normally. Not happening. Something lifted my foot aside. I heard a clink, and the softest rustling. Somebody was going through my pack.